Let It Ride is the story of an inveterate horse-race gambler who has ‘a really good day’. Richard Dreyfuss plays a man appropriately named Trotter, who has decided to give up gambling. Then he overhears two men talking about a sure thing at the race track. He can’t resist betting $50 on the horse; this results in a $700 win. 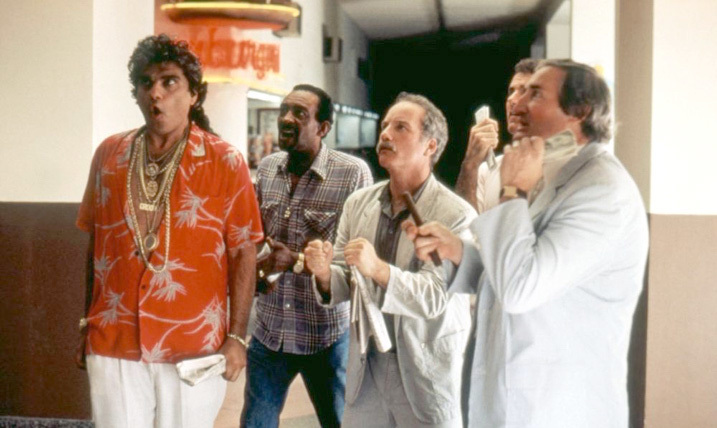 Through a series of events, Trotter spends the whole day at the track, betting. Will his luck holds as he ‘lets it ride’? This is a movie I first saw when it was newly released in 1989. I liked it. I thought it was fun. Either it or I have changed in the intervening years. Let It Ride is not a bad movie, but it’s not a good one, either. I admire Dreyfuss. I find him usually a likeable actor, with whose characters one normally sympathizes. He is a versatile actor, as well, who can perform equally in comedy and drama. Let It Ride definitely fits into the former category, but veers sometimes into farce, while trying to boast elements which are quite serious. That’s one of the problems. Trotter is clearly a man with an addiction. He finds a sure thing and bets, and is genuinely intending to leave at that point. But the men who provided the first tip generously provide a second. Trotter decides to wager again. Anyone could find himself making the same decision. But then he keeps going, basing his choices on, for instance, horses that no one else expects to win. His continuation is because of his feeling that ‘this day is different’ and that he ‘can’t lose’. His wife (Teri Garr) actually tries to leave him because his gambling, and gets drunk over his addiction. This is not the stuff of comedy. If the plot were driven by a series of coincidences that Trotter could not ignore, a series of tips that were too good to pass up, like a situation that snowballs, the basis for the comedy would be less tragic. Having a wife who is utterly miserable because of her marriage is not funny, either. The supporting characters are largely obnoxious. David Johansen, as Trotter’s best friend, is a jerk, who swerves from supporting Trotter to denigrating him, to trying to get him arrested out of spite. As well, Johansen’s overacting is tiresome. Trotter’s cronies in the race-track’s bar run equally hot and cold. The only character who comes across as someone you wouldn’t mind knowing is Robbie Coltrane as a track employee. I imagine the intention was to create a group of people similar to those in Damon Runyon’s stories - the song “Can Do”, from Guys and Dolls figures prominently in the film; if so, the intention was not fulfilled. Trotter himself is portrayed unevenly. Most of the time, he is sympathetic, but even he becomes a crass boor at some points. 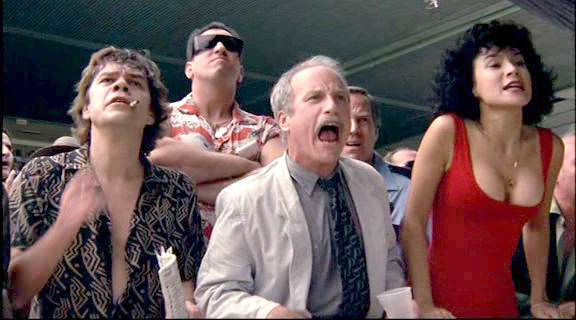 Dreyfuss flips - probably with the writing and direction - from level comedy to broad slapstick and back again, and the viewer never knows if the movie is meant to be realistic or not. 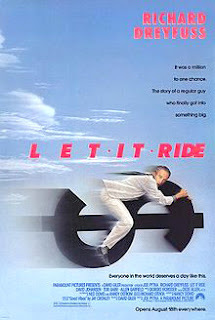 Let It Ride could have been a compact and tidy film with good laughs and even with a moral thrown in (or not, depending on the point of the story). Instead, it becomes a good example of a promising premise spoiled by indecisive execution. Because I'm a "racetrack person," for years, people have been telling me to see this movie. "You'll love it! It's great!" A while ago, I finally rented it, and I couldn't even sit through it. I think I bailed out in less than an hour, and regretted spending that much time on it. I found the whole movie and everyone in it deeply irritating, and worse, it was nothing like the real racetrack world. I'm baffled that this has become a cult movie. I did like hearing my beloved Trevor Denman call the races, though. I know little about the races but it sounds like "Let It Ride" knew as much about real race-tracks as "Nine Lives" knew about owning a cat. 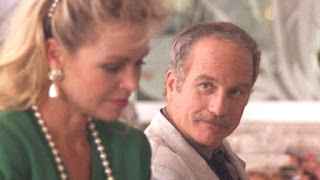 Dreyfuss was also in two films in which Holly Hunter portrayed his wife. A better film of his will be reviewed in the near future.